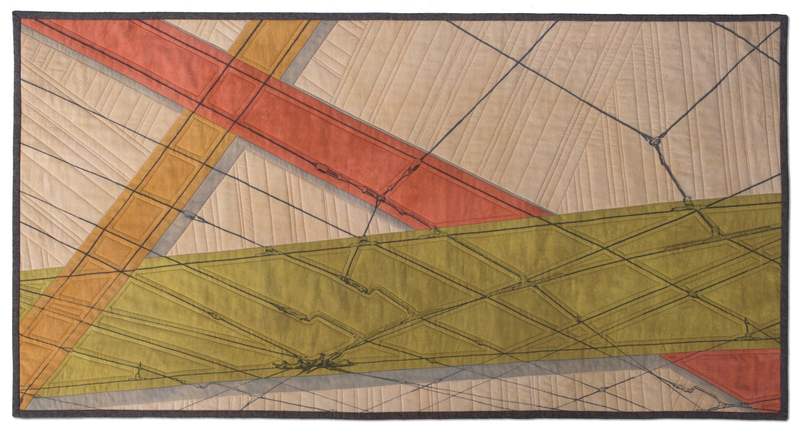 This is way after the fact, but I was thrilled to be selected for first ever artist member show at the San Jose Museum of Quilts and Textiles last fall entitled Juncture. When presented with some challenges (all right, MOST challenges), ideas are slow to evolve. I was really having trouble coming to a satisfactory idea. 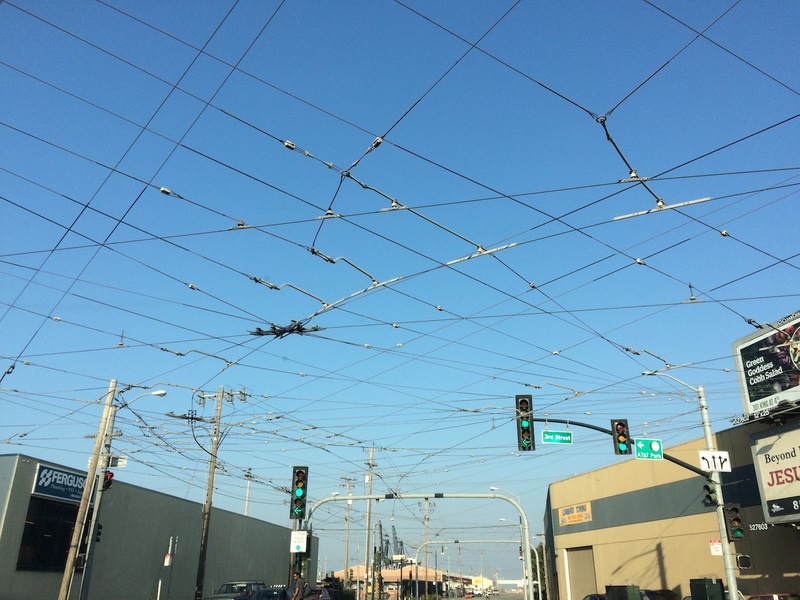 My husband and I were on our way to a Giants game in San Francisco when I looked up and saw all of these wonderful connecting cables for the electric trolleys that run in the city. Talk about junctures! I grabbed my phone and quickly snapped a few photos before the light changed. Let’s face it, not a particularly good photo, but enough to work with! With some judicious cropping, removing the background and then playing with color to emphasize some of the interconnecting lines, I printed the image onto the fabric. I liked the idea of giving the colored sections a little depth and decided to paint harsh shadows onto the piece with Shiva paint sticks. Finish the piece off with some quilting that gave the feeling of tension – of being pulled in many directions, and I was almost there. With approximately an hour and a half until the entry deadline, I was putting the binding on. I decided to glue baste so that I could get the pictures taken and sent in. Piece of cake, right? Evidently my brain decided to take a holiday and I forgot how to do binding. A frightening mess ensued and I ended up having to cut and glue the corners to make it “look” acceptable in the photos and just send them in THEN rip it all out and finish it correctly – all done the next day when I was somewhat sane again. Frightening how the simple things can defeat you sometimes! In any case, this is my piece Choices. Sue, I loved seeing your inspiration photo and what you did with it. So interesting to see what you cropped and cut out, what you highlighted and what you changed. Congratulations on a gorgeous piece.